Allow me to be blunt: Judge Brett Kavanaugh lied about the SeaWorld case during his Senate Confirmation testimony last week and he showed very little understanding of the Occupational Safety and Health Act. Being as Judge Kavanaugh is a great girls basketball coach in the crime-ridden streets of Bethesda, Maryland, however, these facts probably won’t make much difference to Republicans in his confirmation vote. But for those who take the Supreme Court — and workers’ rights — seriously, the facts are the facts. And these facts should be very troubling for American workers. I can’t figure out how the lies in Kavanaugh’s testimony or his legal misunderstanding of the OSHAct would get a passing grade in the first year of law school, much less a lifetime seat on the Supreme Court of the United States. In case you’re just tuning in, in 2010 SeaWorld killer whale trainer Dawn Brancheau was dismembered and killed by a killer whale during a live show in front of hundreds of horrified customers, including small children. 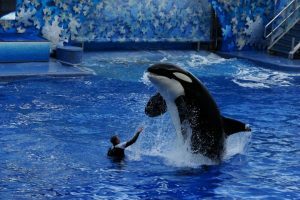 OSHA, which had proven that SeaWorld was aware that the whale that killed Brancheau, had been involved in previous trainer fatalities, and that killer whales in general were hazardous to trainers, cited SeaWorld and ordered them to use physical barriers or minimum distances to separate trainers from whales. SeaWorld appealed, and both the OSHA Review Commission and the federal Appeals Court found in OSHA’s favor. The only dissent throughout the entire process was Appeals Court Judge Brett Kavanaugh who argued in his 2014 written opinion that OSHA had paternalistically interfered in a worker’s right to risk his or her life in a hazardous workplace, that OSHA had violated its long-standing precedent not to get involved in sports or entertainment, that the agency had no authority to regulate in the sports or entertainment industries and that Congress — and only Congress — could give OSHA that authority. So, let’s fast-forward to last Thursday, when Kavanaugh was questioned about his SeaWorld dissent by Senator Diane Feinstein (D-CA) during his Supreme Court confirmation hearing. You can watch and listen to the exchange beginning at 1:42:16 of Thursday’s hearing here. Senator Feinstein: “Judge Kavanaugh, you sat on a case where a trainer, Dawn Brancheau, was killed while interacting with a killer whale during a live performance. Following her death, the Occupational Safety and Health Administration found that SeaWorld had violated workforce safety laws. The majority agreed with the agency, that SeaWorld had violated the law. According to what I know, you disagreed. In your dissent, you argued that the agency lacked the authority to regulate employers to protect participants in sporting events or entertainment shows. However the statute, as enacted, applies to each employer and it defined employer as anyone engaged in business affecting commerce who has employees. There are several problems in Kavanaugh’s statement. There is no precedent for OSHA not regulating the entertainment industry. In June 2013, Nevada OSHA fined Cirque du Soleil $23,035 for five violations after a performer in the show “Ka” at the MGM Grand Hotel and Casino in Las Vegas was killed after falling 94 feet during a show. The wire rope attached to her harness broke because it was scraping against a sharp edge. In November 2014, Federal OSHA cited the Ringling Bros. and Barnum & Bailey Circus after eight performers fell more than 15 feet during the “hair hang act” as they were suspended from a twirling frame by their hair. According the OSHA investigation, “The hair hang act was advertised as a spectacular and thrilling act to perform and watch. Six performers are hung from their hair from an overhead hexagonal steel framed apparatus.” OSHA determined that a steel carabiner holding the performers was not strong enough to support their weight. One other thing. Kavanaugh was not only wrong, but he was just making stuff up: SeaWorld didn’t even argue that its whale trainers weren’t covered by OSHA because they were in the entertainment business. It wasn’t part of the case until Kavanaugh raised the issue. Judge Kavanaugh to Senator Feinstein: “The Labor Department in the oral arguments tried to distinguish, for example, the dangers of football from the dangers of the SeaWorld show and I did not, as I explained in the opinion find that argument persuasive. In the real world, it is simply not plausible to assert that Congress, when passing the Occupational Safety and Health Act, silently intended to authorize the Department of Labor to eliminate familiar sports and entertainment practices, such as punt returns in the NFL, speeding in NASCAR, or the whale show at SeaWorld. So can the Department of Labor change OSHA’s (non-existent) precedent, or can only Congress change OSHA’s (non-existent) precedent? It apparently depends on which Brett Kavanaugh you’re talking to and which day you’re talking to him. But is close personal contact between trainers and the killer whales during performances “intrinsic” or “essential” to SeaWorld’s killer whale shows? The answer is no. The main attraction of whale shows is watching the whales jump out of the water, do clever tricks and splash the spectators. Sure, the audience may also enjoy watching the trainers hug and cuddle the whales, but the show goes on even without the close, personal contact, as SeaWorld itself admits by the fact that they are continuing to allow their customers to “journey into the world of majestic killer whales” without the close contact between the whales and the trainers. People still seem to enjoy the show even without the opportunity to watch a trainer get killed during the performance. Kavanaugh is Wrong: OSHA is permitted to regulate in “new” areas that Congress didn’t specifically mention 50 years ago. The possibility OSHA might be confronted by “new” hazards that Congress did not foresee in 1970, or hazards for which there was no specific OSHA standard, was clear to the founding fathers of the Occupational Safety and Health Act (OSHAct) when the law was passed almost 50 years ago. To ensure that OSHA would be able to require employers to protect workers from these “new” hazards, the OSHAct contains the “General Duty Clause”(Section 5(a)(1)), which enables OSHA to cite employers for exposing employees to hazards for which there are no standards as long as the hazard was “recognized” (by the employer or by the industry) and where there was a “feasible” means of preventing or reducing the hazard. SeaWorld was cited under OSHA’s General Duty Clause because the hazard of killer whales was well recognized by SeaWorld (and the industry), and because it was perfectly feasible to carry on with whale shows without exposing the trainers to death and dismemberment. Furthermore, “new” hazards have also never been a legal problem for OSHA before. Many serious hazards facing workers today were not envisioned when the OSHAct was passed in 1970, but OSHA still regulates those hazards. Workplace violence and ergonomics are two examples of “new” hazards that are regularly cited under OSHA’s General Duty Clause. The legislators that wrote the OSHAct most likely never predicted that infectious diseases might be an area that OSHA would someday regulate. And indeed, OSHA’s Bloodborne Pathogens standard, issued in 1990, was initially opposed because because infectious diseases were an area that OSHA had never regulated before the scourges of HIV/AIDS and hepatitis B started killing health care workers in large numbers. Yet today, thanks to OSHA’s ability to regulate in areas that Congress never foresaw, thousands of health care workers owe their lives to OSHA’s Bloodborne Pathogens standard. Kavanaugh is Wrong: Whale training is not a sport. Killer whale trainers are not athletes; they’re workers in the entertainment industry. And killer whale shows are not sports. There is no fight between whale and human (or there shouldn’t be). No one is trying to win. No one keeps score. No one is supposed to get hurt. No one is supposed to die. Killer Whale shows are not sports. There is no fight between whale and human (or there shouldn’t be). No one is trying to win. No one keeps score. No one is supposed to get hurt. No one is supposed to die. The use of lawsuits as the only recourse for workers in unsafe jobs went out of fashion (and law) 100 years ago. One would think that Kavanaugh, as a distinguished jurist being considered for the Supreme Court, would be aware that ever since the creation of workers compensation laws in the early part of the 20th century, employees have generally not been allowed to sue their employers after being hurt on the job. And the whole point of the OSHAct is to make the workplace safe before workers get hurt, not after it’s too late. When should we as a society paternalistically decide that the participants in these sports and entertainment activities must be protected from themselves—that the risk of significant physical injury is simply too great even for eager and willing participants? And most importantly for this case, who decides that the risk to participants is too high? When? In 1970, with the passage of the Occupational Safety and Health Act that gave employers the legal responsibility to provide a safe workplace for their employees. Who decides? Congress and then-President Richard Nixon decided, almost fifty years ago with the passage of the OSHAct and the creation of the Occupational Safety and Health Administration. In that sentence Kavanaugh undermines the OSHAct’s clear guarantee of a safe workplace to every worker, and the employer’s responsibility to provide that safe workplace. Now I’m no lawyer, nor am I a professor of law, but I can’t figure out how the lies in Kavanaugh’s testimony or his legal misunderstanding of the OSHAct would get a passing grade in the first year of law school, much less a lifetime seat on the Supreme Court of the United States. He has made clear that he does not believe in the mission of OSHA, the goals of the Occupational Safety and Health Act or what Congress actually said in the law, despite his claim to be a textualist. He has shown himself, under sworn testimony, to be willing to make up facts and legal theories out of thin air to support his corporate-first ideology. He is not fit for the Supreme Court. What you get is 60 pages of legal sophistry, procedural hair-splitting and scientific conjecture. You find a judge without a shred of technical training formulating his own policy solution to an incredibly complex problem and substituting it for the solution proposed by experienced experts. You find an appeals court judge so dismissive of the most fundamental rules of judicial restraint that he dares to throw out regulations on the basis of concerns never raised during the rule-making process or in the initial court appeal.